St. Johns County Recycling Got an Upgrade – The upgraded recycling program gave residents the opportunity to recycle easier and with more convenience while offering the capability of more volume. Upgraded Recycling Program. Schedules are managed by service providers. You can get your pickup day(s) directly from them. If you don't know who your provider is, please call our office at (904) 827-6980 for assistance. Advanced Disposal services residents in the southern half of St. Johns County (south of the St. Johns River following CR 208 and south of SR 16 to the ocean). 3530 Agricultural Center Drive, St. Augustine, FL 32092. (904) 827-1005. Advanced Disposal Recycling Program FAQs. Republic Services services residents in the northern half of St. Johns County (north of the St. Johns River following CR 208 and north of SR 16 to the ocean). 445A International Golf Pkwy, St. Augustine, FL 32095. (904) 825-0991. Republic Recycling Program FAQs. For a recycling cart and collection of white goods, please call your service provider. Place all household garbage into trash cans or plastic trash bags secured to prevent scattering of waste due to animals or wind. All residential waste must be placed curbside within 3 to 5 feet of the edge of the traveled portion of the roadway. 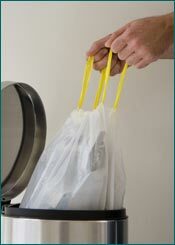 Place cans and bags curbside by 6am on scheduled collection day. Non-containerized garbage, excluding bulky waste, will not be collected. No can or bag may exceed 50 lbs. Yard waste, including bagged debris, is picked up on standard collection days by Advanced Disposal or Republic Services. Branches, shrubs, and stumps (not over 6 ft. in length or 50 lbs. in weight) should be stacked neatly parallel to the curb. Leaves, grass clippings, twigs and small pieces of yard waste MUST be bagged, bundled, tied, or in a garbage receptacle no larger than 32 gallons and 50 lbs. Palm fronds should be stacked in neat piles on top of one another with the fan portion facing away from the curb. Items that are not yard waste include: Whole trees, land clearing debris, yard waste weighing more than 50 lbs. or more than 6 ft. in length, small pieces of yard waste not properly bagged or containerized, fencing, landscape timbers, garden hoses, planters, flower pots, and yard decorations. Place recyclable items in the recycling bins provided by your service provider by 6a.m. on the scheduled collection day. Recyclables, white goods and more information. Please Note: Garbage, recycling and yard debris must be separated by the residents for pick up. Household Hazardous Waste can be dropped off (free of charge) at Tillman Ridge or Stratton Rd Transfer Stations. Oil-based paint, latex paint, fluorescent light bulbs and waste tires must be brought to either the Tillman Ridge or Stratton Rd. Transfer Stations for disposal (fee charged). Construction & Demolition Debris must be taken to St. Marks C&D Disposal Facility off of International Golf Pkwy, (904) 825-2105 or Waste Pro Transfer Station off SR 207, (904) 819-1738.